"The game provides provocative combinations of words that spur thought. At times there is an interesting conjunction of words that make one rethink injustice or social problems." "This app is a great way to practice brainstorming game ideas. At first the categories always seem perplexing and incompatible, but once our group gives them some thought the floogdates open and the ideas start flowing!" "We love using these cards because they are a great physical prop to use when talking about game design. These concepts can be very abstract, so it is great to have something physical to point to and hold." "I have used the Grow-A-Game cards in many situations and the results have always been fruitful and very often surprising in the best possible ways. As a brainstorming tool, it helps folks think about games and game systems in approachable, provocative and liberating ways. The cards are adaptable in their usage and I have found that very experienced designers, as well as those new or simply curious about the process, learn something meaningful." "Before I found this life-changing app, I was a cultural outcast, a social misfit with nothing to offer a party save a smile, good humor, great looks, and wonderful company. Now, this has all changed. The second I walk in the building, I pound my chest and scream as loud as I can: "LETS INVENT A GAME." I then proceed to flip out my smart phone and open the app, as those in the room stare at me, curiously, in suspense." Tiltfactor is delighted to be able to share some design methods with the public. 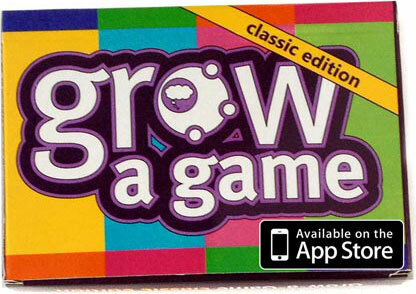 Developed as part of the Values at Play project, the Grow-A-Game cards are widely in use in both K-12 and University classrooms. Using Grow-A-Game, groups of people brainstorm novel game ideas which prioritize human values. While no prior game design experience is necessary, both experienced designers and those new to the field will have fun making games. In response to consumer demand, our team has created three distinct sets of the cards, with each version designed specifically to meet the needs of a particular user group. Expert, geared toward advanced students for expert designers. This version is intended to complement more conventional brainstorming methods and without example games to modify. Belman, Jonathan, Mary Flanagan, and Helen Nissenbaum. “Instructional Methods and Curricula for Values Conscious Design.” Loading: The Official Journal of the Canadian Games Studies Association 3.4 (2009). Web. Flanagan, Mary, Daniel C. Howe, and Helen Nissenbaum. “New Design Methods for Activist Gaming.” Proceedings of DiGRA 2005 Conference: Changing Views – Worlds in Play. Vancouver, BC. 16-20 June, 2005. Flanagan, Mary, Daniel C. Howe, and Helen Nissenbaum. “Embodying Values in Technology: Theory and Practice.” Information Technology and Moral Philosophy. Ed. Jeroen van den Hoven and John Weckert. New York: Cambridge University Press, 2008. 322-353. Print. Flanagan, Mary. “Troubdivng ‘Games for Girls’: Notes from the Edge of Game Design.” Proceedings of DiGRA 2005 Conference: Changing Views – Worlds in Play. Vancouver, BC. 16-20 June, 2005. Flanagan, Mary, Helen Nissenbaum, Jim Diamond, and Jonathan Belman. “A Method for Discovering Values in Digital Games.” Proceedings of DiGRA 2007 Conference: Situated Play. Tokyo, Japan. 24-28 September, 2007. Flanagan, Mary, Daniel C. Howe, and Helen Nissenbaum. “Values at Play: Design Tradeoffs in Socially-Oriented Game Design.” Proceedings of CHI 2005 conference. Portland, OR. 2-7 April, 2005. Flanagan, Mary, and Helen Nissenbaum. “A Game Design Methodology to Incorporate Activist Themes.” Proceedings of CHI 2007 conference. San Jose, CA. 28 April-3 May, 2007.